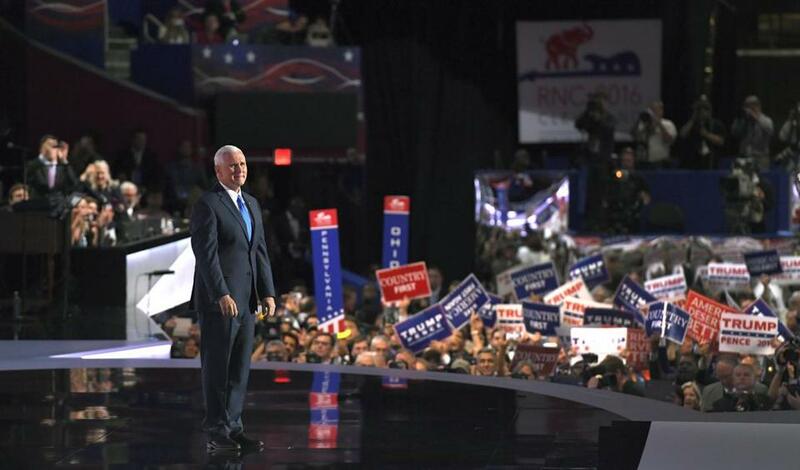 Republican vice presidential nominee Mike Pence has joined others in criticizing presumptive Democratic presidential nominee Hillary Clinton during speeches at the Republican National Convention in Cleveland. WASHINGTON — Donald Trump’s new running mate and other Republicans are wrongly accusing Hillary Clinton of speaking with indifference about the death of Americans in Benghazi, Libya — twisting her comments out of context to make their indictment. THE FACTS: At no point has Clinton said — or even implied — that it makes no difference whether Americans died in the Benghazi attacks. Clinton’s well-known quote came at a January 2013 Senate hearing when she was pressed about the motive for the attack that killed four Americans, including Ambassador Christopher Stevens. Her point was that it was less important to understand the reason for the attack than in knowing what to do about it. Republicans have persistently criticized the Obama administration for initially and wrongly blaming the attack on an anti-U.S. protest. Whether Clinton as secretary of state acted properly in that crisis is a matter of enduring debate. But she was not, as Pence and Cruz suggested, cold about the fact that Americans died. THE FACTS: While true, Pence’s balanced-budget claim isn’t much to brag about. He’s required to do that by law, as is every state except Vermont. And his biggest contribution to ‘‘low taxes’’ was a reduction of Indiana’s income-tax rate from 3.4 percent to 3.3 percent last year — a savings of about $50 a year for someone with $50,000 in taxable income. THE FACTS: It’s not as close at it had been before a nuclear pact completed a year ago between Iran and world powers. The deal suspends oil, trade and financial sanctions in return for Iran rolling back its nuclear program. Before the deal, Iran was just a few months away from having enough weapons-grade uranium to build 10 to 12 nuclear weapons, according to the U.S. government. Now, if Iran were to race toward an atomic weapon, the Obama administration and most independent experts say it would need at least a year, which they say would be enough time to discover the effort and intervene. THE FACTS: Clinton was not personally paid for making any speeches in Saudi Arabia or other Mideast nations. Instead, it was the Clinton Foundation, the family charity that she briefly headed after leaving the State Department, that received millions in donations from Saudi Arabia, the United Arab Emirates, Qatar and several other Mideast nations. Most of those donations were made before she took a leadership role in the charity after stepping down as secretary of state in 2013. Her husband, former President Bill Clinton, was personally paid $300,000 each for speeches to two companies in Saudi Arabia and $600,000 for a speech sponsored by a UAE government initiative. THE FACTS: Without ‘‘Obamacare’’ or some replacement, millions of people would lose health insurance, which could make it tough for them to choose a doctor. About 20 million people have gained health insurance since the law passed, and experts attribute most of that to the law. THE FACTS: The U.S. continues to have the most powerful military in the world. Although defense spending has declined with the end of the war in Iraq and the drawdown of NATO forces in Afghanistan, in 2015 the United States still spent nearly $600 billion on its armed forces — more than the spending by the next seven biggest-spending nations combined. China, the second-biggest spender, has a defense budget less than a third of the Pentagon’s. THE FACTS: Such an assertion fits the GOP convention’s theme of raising fears about the nation’s current political leadership, but it’s a stretch to say the danger has escalated since the 9/11 attacks. Terrorist groups such as the Islamic State group have exploited social media to promote sudden and frightening acts of violence, and some mass killers in the last year have publicly espoused radical ideology. But in the last 15 years the nation has spent massively on new security systems. The FBI has reinvented itself into a terrorism-fighting agency, securing surveillance powers that have diminished the likelihood of a coordinated attack in multiple cities. The FBI says it’s tracking roughly 1,000 people it views as having terrorist aspirations. And airline security measures have made it much tougher to hijack planes. Associated Press writers Michael Biesecker, Stephen Braun, Deb Riechmann, Ricardo Alonso-Zaldivar, Brian Slodysko and Eric Tucker contributed to this report.